For use in petroleum, chemical and oil transfer, petrochemical vapour recovery, all loading arms in bottom loading operations, as well as tank truck delivery. Flexible and lightweight liquid transfer and bottom loading composite hose offer optimum chemical resistance to aggressive media. 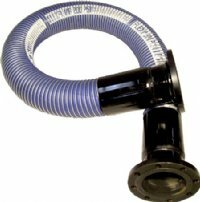 Composite hoses are available in a complete range of advanced films and fabrics to meet all hose requirements, with externally crimped dry seal fittings in diameters from 1" to 10".